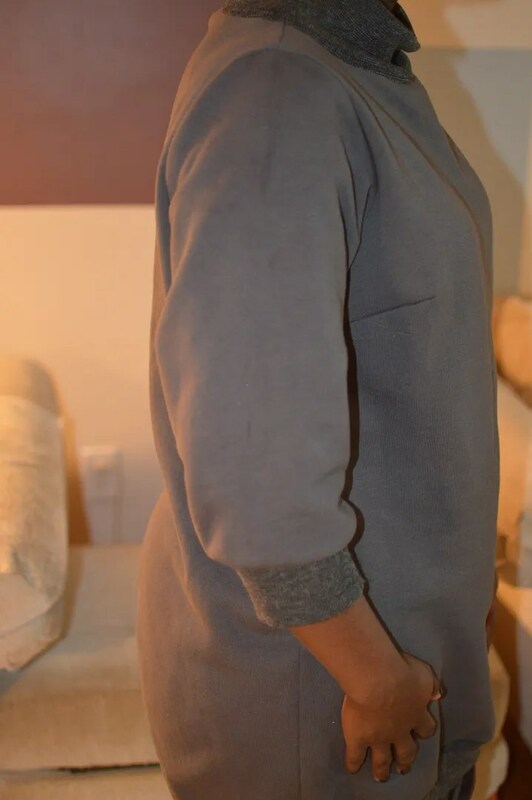 One of my most worn and beloved garments is my LMB sweatshirt dress from the August 2008 Italian magazine. 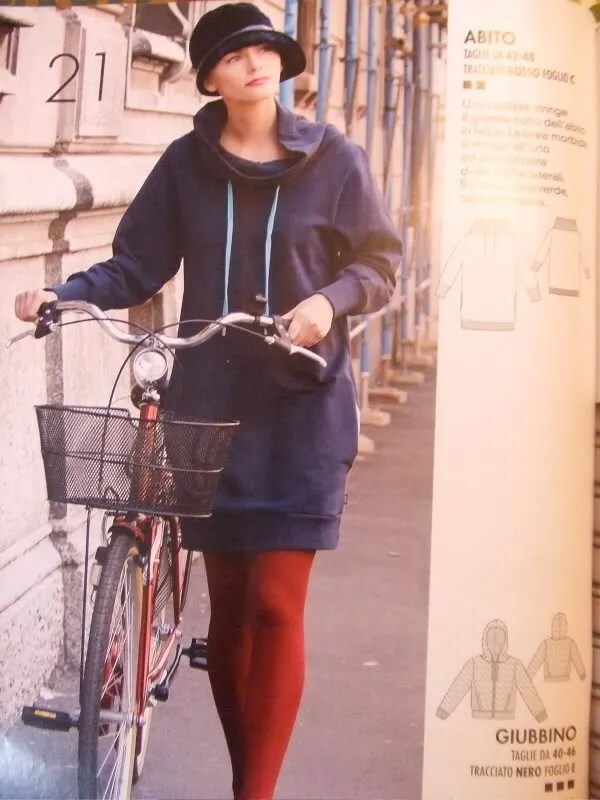 Such a simple design and concept in a sweatshirt dress. I got compliments every time I wore that dress! After five years of wear, I thought it was time I made up a new one. Or, two. Yes, yes. In my last post I said I was getting back to color. And, yet, here I am again sewing grey and navy. What can I say? I’m currently a sucker for simplicity. Like last time, I made the largest size in LMB, a 46 and left off the pockets. Which, makes me think I was sewing clothes way big for me five years ago. Or, I like my clothes a little snugger now? 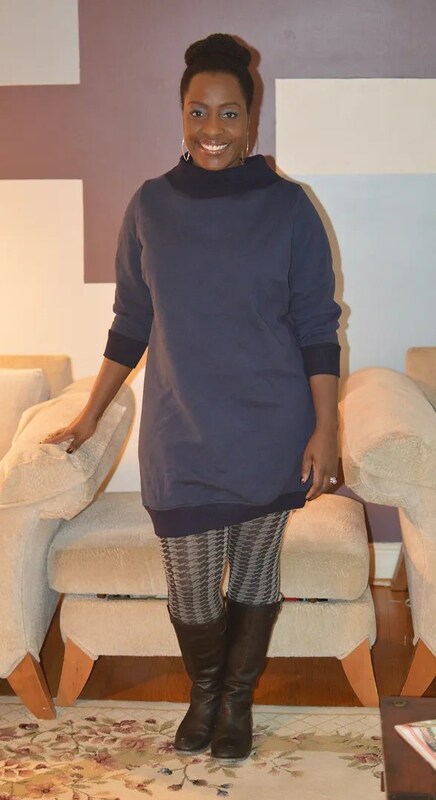 But, this time I added some six centimeters of wearing ease around the thighs and attempted a FBA. Other alterations? Well, I tried to add some shaping at the waist. It remains unclear if this worked or not. I also took off my standard 1/4 inch off the shoulders. I also shortened the sleeves a good three inches. And, I took about four inches of length off the hem of the original pattern. One thing I’ve noticed is I have inconsistent dart placement when I add FBAs to garments. Sometimes they are SO LOW. In this one, I had to take out my original dart and pin it into the right place. In retrospect, this probably could have been a dartless FBA to keep with the loose fitting silhouette. I sewed everything but the darts on my serger. And, if you’re wondering, my ribbing is all local and $1 a pack. That’s right. Stadham Corp here in Baltimore charged me $1 for a pair of cuffs and another $1 for the hem cuffs. And now I’m off to work on a Valentine’s Day dress. We’re spending the long weekend in San Antonio, Texas. We debated between there and Cleveland, Ohio. But, based on today’s weather report, it’s already 30 degrees warmer in San Antonio than both Baltimore and Cleveland. So, that was an easy choice. LOL-well Cleveland does rock, but unfortunately they’re going to get a boatload of snow tomorrow, which is highly unlikely in San Antonio! We lived in SA four years, this is the best time of year to go, really.Have a great weekend! San Antonio is on our places to visit next time we visit Alex in Austin. Have a great, romantic weekend. They’re cute! And, I had no idea you can buy knit rib in pre-packaged sleeve and waistband sections. Who knew?! I’ll have to dash to my local F-land and check them out….. So cute, and navy IS a color. (In my world, anyway.) 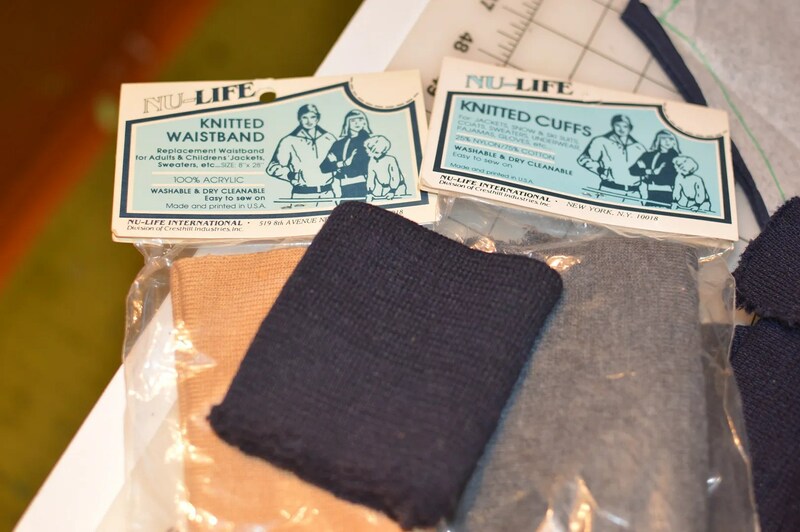 Major steal on the prepackaged cuff and hem rib knits. Wish I could get those locally. What a great and comfortable dressGray is a color, too! Gray forever!!! Really stylish on you….any idea where to get this pattern/back issue? Really like that sweatshirt dress. I would so wear that. To bad that is not a pattern one can buy from a regular pattern company. It would go on my list. Such a nice neckline on this dress, I can see why it would be re-run. This is so cute! Have a great time in San Antonio! I wore a lot of “sweatshirt” dresses by Norma Kamali in the 80s. With the huge shoulder pads! Might be time to revisit that idea (without the football-player look). That dress is really cute! Dude, I love this dress. It’s such a great style! I would wear this all the time! A nice way to handle “droopy dart” — at least for a relaxed style of garment — is to ignore sewing up the dart, and simply gather the excess fabric between the legs of the dart, at the side seam. I’ve had success with this in knits and in wovens. I had no trouble sewing either a french seam or a felled seam with the gathers (un-gathered side of seam folded over gathered side). That looks super comfy! I could totally see me wearing that all the time! 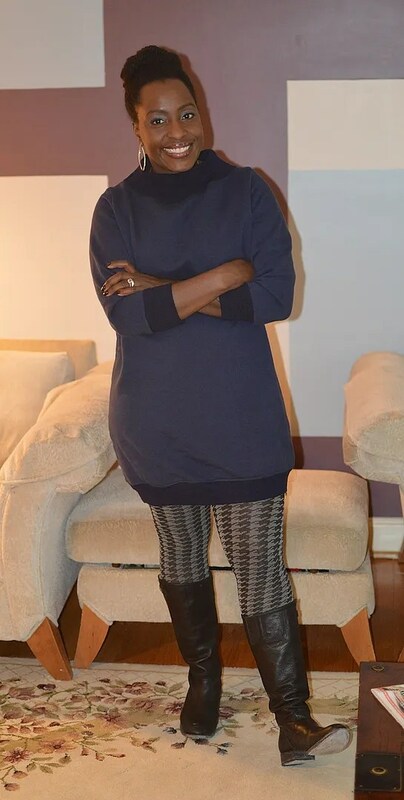 I love anything I can put with tights and boots. Look at your big smile! 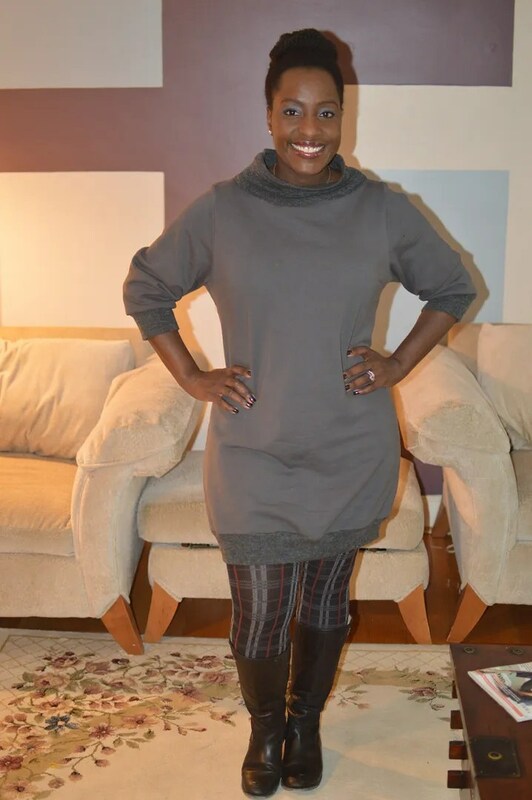 It says it all…comfy, and stylish and flattering colors…you nailed it, Renee! Oh wow! My husband and I just moved to San Antonio about a year and a half ago. I suggest you stay on the riverwalk. That way you can walk to all the shops/places to eat. Please don’t set your whole trip around the Alamo. It’s not that big. La Mansion on the riverwalk has an awesome brunch on sundays. Also the city has bikes and trails throughout the whole thing. Sorry but San Antonio doesn’t have any good fabric shops. Just the usual ones. If you want to try something authentic, get a raspa (shaved ice) mangonada, picadilly and chamoy are flavors that sound weird but are soooo good.If you want any hints on where to go please don’t hesitate to ask.